Hello, you special lady you! Valentine's Day is coming and I'd like to share with you something I've been working on getting just right. I hope you love them as much as I loved creating them for you. In other ILNP news, the Ultra Minis are still coming soon! We had some issues with packaging but have since resolved them and now we're anxiously waiting for everything to finish and ship to us here in Vegas. Once you see them, you're going to fall in love! When a girl wants chocolate, you give it to her! Uncontrollable cuteness to the max! Did we mention it has pink hearts? It has pink hearts. Refreshingly beautiful and soft. All of the satisfaction, none of the calories! An elegant blend of sheer teal and gold glitters. Sophisticated, classy, and impressively beautiful. An extravagant ruby red glitter topper. We’re definitely not in Kansas anymore! 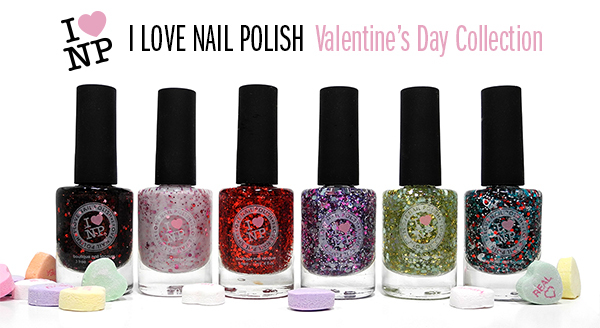 A super fun blizzard of white, red, turquoise, and black glitters -- with a dash of white hearts.